The special Sauk Prairie Day held on Saturday, August 29th and coordinated by the Alliance in partnership with The Prairie Enthusiasts, attracted an overflow crowd of more than 150 people to the Ruth Culver Library in Prairie du Sac. Four exceptional presentations by local experts in their field provided different perspectives on what “Sauk Prairie” means. 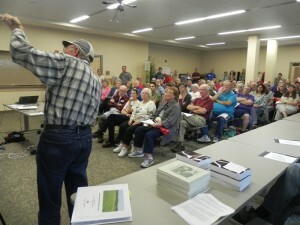 Ken Lange, retired naturalist at Devil’s Lake State Park and noted regional author, provided an introduction to the geographic and geological setting that allowed for the formation of the original 14,000-acre Sauk Prairie. Dr. Alison Duff, an ecologist and lecturer at UW-Madison, answered the question “what is prairie?” in her “prairie primer.” Alison was followed by Dr. Curt Meine, biographer of Aldo Leopold and renowned author, who quite effectively summarized 14,000 years of human history on the Sauk prairie in his 30 minutes at the podium. Randy Poelma, biologist with the Ho Chunk Nation and Chairman of the Ho-Chunk Nation Badger Oversight Team, ended the morning with a summary of the Ho Chunk Nation’s intentions for the more than 1,500 acres of land they now own at the former Badger Army Ammunition Plant. 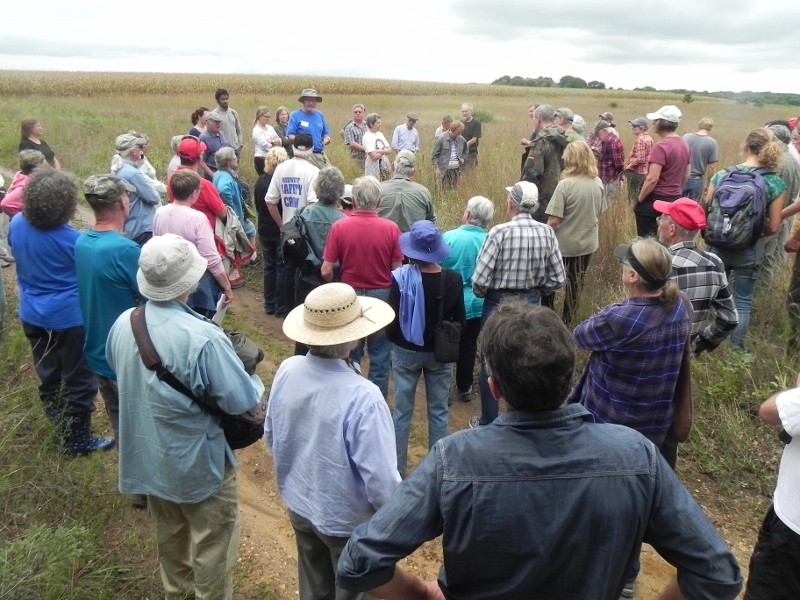 The day ended with a 3-hour tour of nearby prairie remnants of the original Sauk Prairie, attended by more than 80 people. The small but diverse Moely and Schluckebier Prairies located on the outskirts of Prairie du Sac, now managed by The Prairie Enthusiasts, offered visitors a lovely show of native goldenrods, blazing star and prairie grasses. 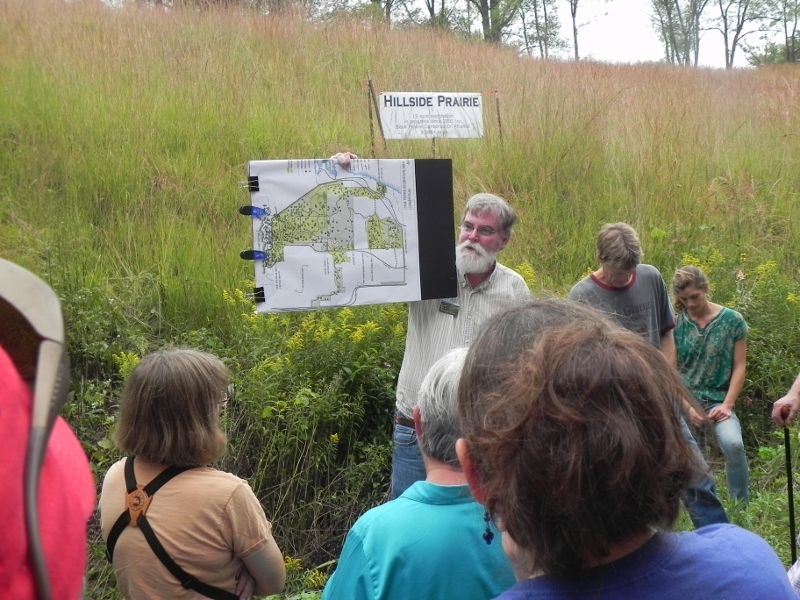 The tour ended on the Ho Chunk land in the northern portion of the former Badger Plant and then at what is know as “Hillside Prairie” on state land in the southern portion of Badger. While naturalists helped participants identify native flora and fauna, Curt Meine shared stories and samples of heritage apples that occur on Badger lands. The apples were planted by Sauk Prairie farmers decades ago and they pre-date the construction of the Badger Plant in 1942.